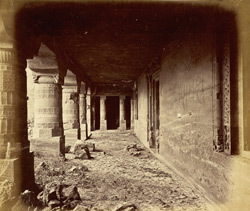 Photograph of the verandah of the Buddhist Vihara, Cave XXIII at Ajanta, taken by Robert Gill in c.1868-70, from the Archaeological Survey of India Collections. The Buddhist cave temples of Ajanta were excavated into a horse-shoe shaped cliff overlooking the Waghora River in the 2nd and 1st centuries BC. Cave 23 belongs to a later phase, from the end of the 5th century. Although the cave is incomplete many columns of the verandah are richly ornamented with foliation and jewelled bands. The capitals are carved with small figures of ghanas supporting the brackets. This view shows the verandah looking towards one of the two side shrines.